For the last month or two, my brother Mark Hodder and I have been working on a new marketplace / membership site for WordPress child themes. Last week we opened the internet doors to our site and found it was well-received (phew) by both Thesis and Genesis users alike. 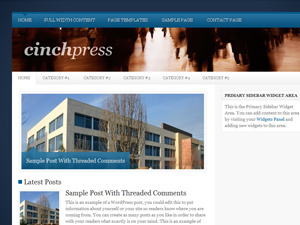 Cinchpress - One of many Child Themes currently available. Like previously mentioned, Themedy is a marketplace for child themes. We offer both identical themes for Genesis and Thesis, so if you are someone who runs multiple sites or you ever have to change frameworks, we have you covered. We also offer both individual theme purchases ($39.95) or monthly/lifetime membership plans. With our membership plans, you get access to ALL current and future themes and full support for the duration of your membership. Unlike our other project Thesis Themes, Themedy will not be selling third party themes, but is 100% developed and supported by the Themedy duo. We also plan on having an affiliate program up in May for anyone interested in making some moolah.